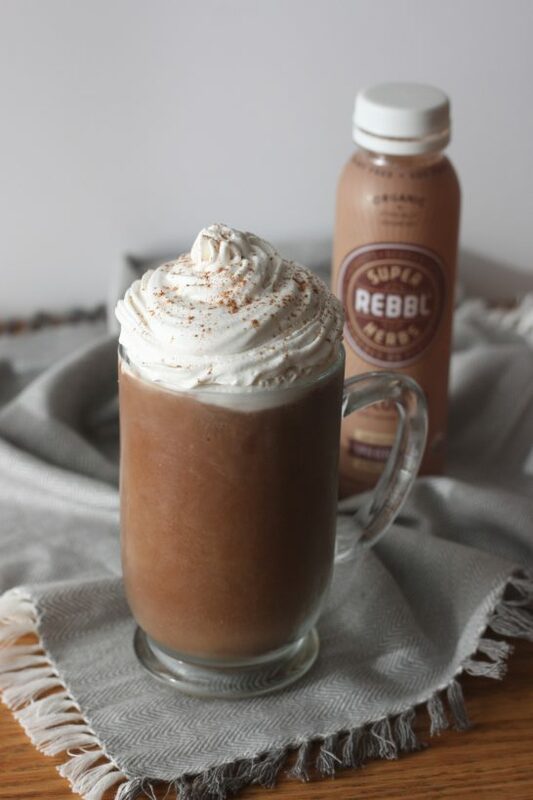 Today’s recipe is sponsored by REBBL, maker of my favorite grab and go coconut milk-based elixirs! It’s back, yep pumpkin season! If you’re a pumpkin lover like me I’m sure you’re as excited as I am. There always comes that time of year, that first cooler day, which is usually in August here, that you get a pumpkin craving. You fight the craving and then often debate when it is it ok to give into everything pumpkin – the first of September or the first day of fall, which is weeks later. Not that pumpkin is only a fall thing, I love it year round, but the pumpkin lattes, mochas, candles, pies, everything pumpkin, caramel, and spice are traditionally fall favorites. One of the first things I want when it comes to pumpkin is all the pumpkin candles so my house smells yummy and the PSL, pumpkin spice latte. Oh yes, I said it. While I’m not a fan of the sugary coffee house pumpkin lattes, I love making them at home. This year, I’m making something a little different. I’m craving pumpkin and chocolate together, oh they make a delicious combo! If you’re a regular reader or know me, you know I love my coffee all day every day. Well, I’ve been trying to drink less, and I’ve recently tried to eliminate it from my daily routine, because it’s not agreeing with me despite my attempts to ignore it. It’s been a little easier since I first put my lips on a cup of warm homemade Pumpkin Maca Mocha! Yes, a coffee-free mocha that tastes so good and is good for me. Since the weather during this time of year is a little all over the map, I had to make a cold version to enjoy during the warmer days. There is a reason why both hot chocolate and frozen hot chocolate, warm coffee and cold blended coffee drinks exist; there are drinks to hit the spot for whatever you’re craving and whatever the weather is. 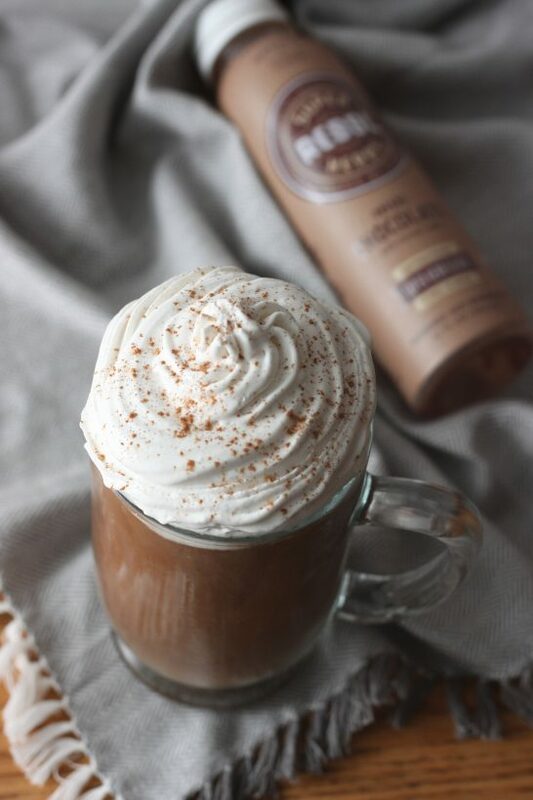 It all started with my Pumpkin Maca Mocha, which is easy to make hot or cold with only 3 ingredients (4, if you add the optional coconut whipped cream). 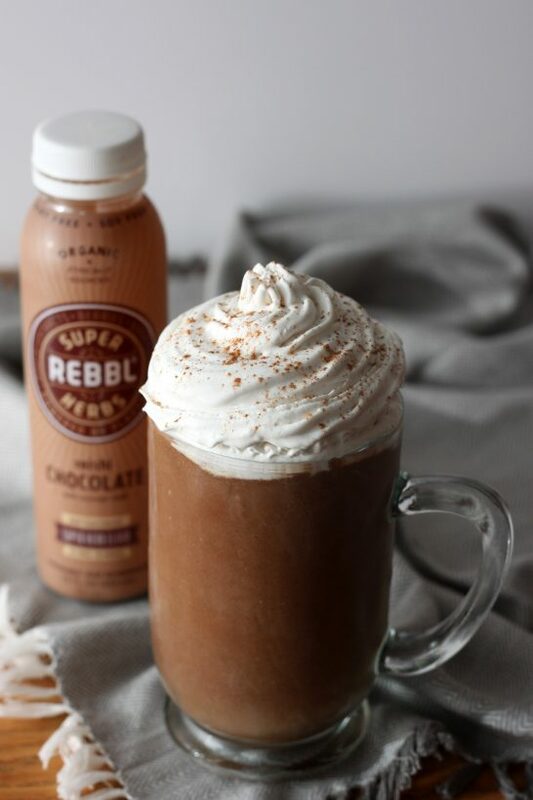 All you need is a bottle of REBBL Maca Mocha, which happens to be one of my favorite REBBL flavors, pumpkin puree, and pumpkin pie spice. If you missed my post talking about REBBL coconut milk-based elixirs in my Golden Banana Bread Chia Oats, let me tell you that I love REBBL! Their elixirs are more than just delicious bottled beverages, they are also good for you. If you are a regular reader, you know I don’t usually do sponsored posts. If I do, it is only for products I love and my family or I consume and buy on a regular basis. It’s also about the company behind the product. 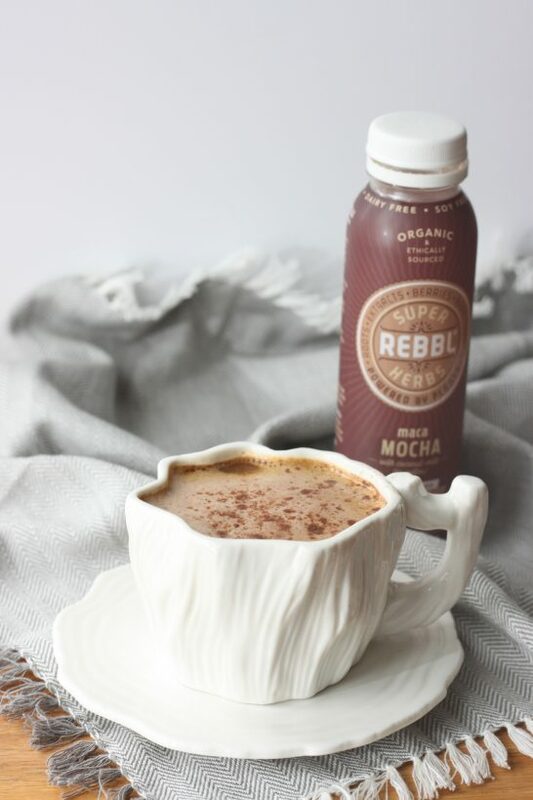 REBBL uses organic ingredients, fair trade when available, and is made with real food ingredients (no thickeners or artificial flavors). Their name says it all – Roots Extracts Berries Bark and Leaves. Their beverages are dairy free, soy-free, organic coconut milk based, and all vegan with the exception of their Turmeric Golden-Milk and their Matcha Latte as those both include organic honey. You can read more about their sourcing, philosophy, and how they give back with Not For Sale. Because I feel good when I drink it and because I trust the company behind the product, REBBL is one of the brands I love. Perfect to have on-hand for the times when I’m trying to reduce or cut out coffee, I grab a Maca Mocha (no coffee) for a quick pick me up. I also love the Golden Turmeric Milk elixir for the times that I’m in the mood, but don’t have the time to make it myself. It’s great that I can still have the healthy superfoods I want when things get crazy like right now when I have to take and pick up the girls from school, volunteer at the school, juggle both girls competitive soccer schedules, gymnastics, my blog, and balance all the household duties while still trying to make time to take care of myself. I actually drive over 30 minutes to the closest local store that carries them and stock up. It’s a Co-Op and they are very helpful and will order whatever I want if they aren’t in stock and the product usually only takes a day to arrive. REBBL’s elixirs are one of my favorite grab and go drinks and I wish they were more easily available here where I live. Their distribution is still expanding, so I’m hoping they will soon be in stores closer to home. When we were in California they were available everywhere! It was great since we were on the go and didn’t have a kitchen or big fridge. I could just stop into a Whole Foods and get one of my favorite drinks. If you are like me and not lucky enough to have REBBL in your local Whole Foods or grocery stores you can request them or check with other health food stores or Co-Ops. So back to the Pumpkin Maca Mocha. If you’re a regular reader, you also know I love my maca. Maca is used to support healthy energy levels, stamina, and endurance, which are all important if you are working out a lot or always on the go. As a mom, this is one of my superfood superpowers. It also supports healthy hormone balance, which is how I was first introduced to maca years ago and started using it. Because it also supports a healthy and balanced adrenal function, I’m now using it to help me reduce/cut out my coffee intake. 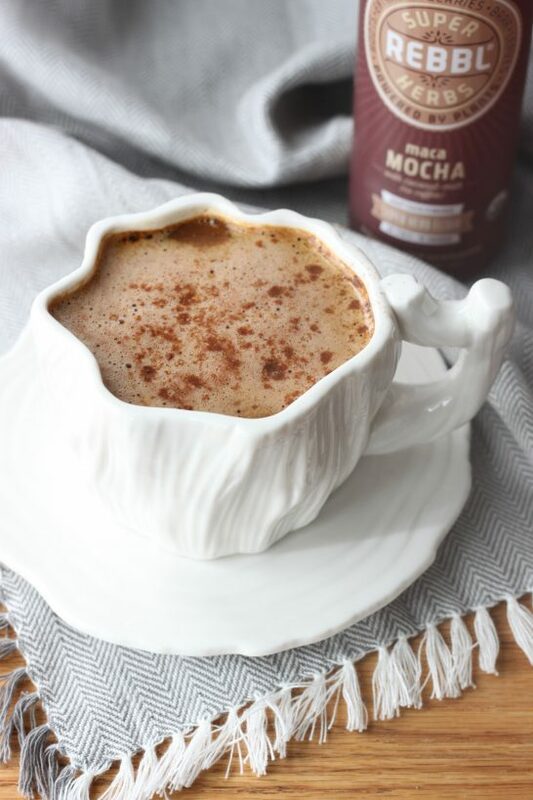 So this Pumpkin Maca Mocha is going to be a staple for me this fall, hot or cold. Mixing things up, because healthy or not there is such thing as too much of a good thing, I also made a version with REBBL Reishi Chocolate. I like this option because some of the protein powders I use regularly also contain maca, I sometimes add maca to my smoothies, and I also enjoy maca chocolate bars. So I don’t blend any of my protein powders that contain maca with REBBL drinks that also contain maca. Reishi is a mushroom that has been used to help enhance the immune system, reduce stress, improve sleep, support cardiovascular health, promote healthy aging, help with fatigue, and aid in protecting and detoxification of the liver. 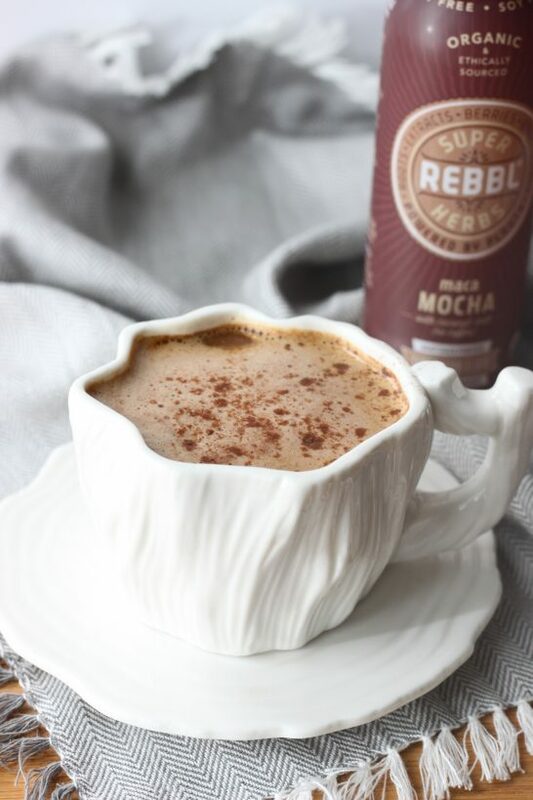 Just like the REBBL Maca Mocha, it’s so delicious that you might forget about all the superfoods and nutrients packed into the drink that are good for you. Hot or cold both recipe options are so delicious and healthy, you won’t think twice about other sugary nutrition lacking pumpkin drinks this fall! If you want a real treat, that’s still healthy, top with coconut whipped cream and a sprinkle of pumpkin pie spice! Make it easy on yourself and purchase coconut whipped cream, like my favorite So Delicious Coco Whip, or make your own at home. It’s easy to make at home with an isi Whipper (finally got one last year), using a hand mixer, or just whipping by hand. You just have to plan ahead and chill your canned coconut milk in the refrigerator overnight. Again, I’m not a doctor or a dietitian but I do my research and try to do what’s best for my body using whole food nutrition and superfoods to give my body what it needs. *REBBL Elixirs can be heated to 180 degrees F and still maintain the efficacy of the herbs, but they shouldn’t stay at this temperature for more than 30 seconds to a minute. For reference when I steam my milk for lattes or mochas I have it set between 135-150 degrees F. Most coffee shops steam milk between 145-165 degrees F from what I’m told. There are a couple ways to make this drink hot depending on what you have at home. You can steam the REBBL elixirs if you have an espresso machine/steamer and then blend in a Vitamix, or high-speed blender,with pumpkin and pumpkin pie spice until smooth. Or you can whisk the REBBL elixir, pumpkin, and pumpkin pie spice together in a pot over medium heat, and continue whisking until warmed to desired temp. Or you can warm the REBBL elixir, and then blend in a Vitamix with pumpkin and pumpkin pie spice until smooth. Top with coconut whipped cream if desired and a sprinkle of pumpkin pie spice. Enjoy! *Measure and freeze pumpkin puree into ice cube trays. You can do this in advance and just grab the number of cubes needed, just remove from tray and place in a sealed container or cover so they don’t get freezer burnt. You can use non frozen pumpkin puree and add ice but it won’t be as rich and creamy. In a Vitamix, or high-speed blender, blend REBBL, pumpkin, pumpkin pie spice, and optional protein powder if desired until smooth. Top with coconut whipped cream if desired and a sprinkle of pumpkin pie spice. Enjoy! Swap your PSL for an easy to make healthy superfood packed Pumpkin Maca Mocha or Pumpkin Reishi Chocolate. Hot or cold they’re both delicious! Vegan, gluten free, dairy free. While I do receive some Vega products from time to time, which I listed as an option in this recipe, I do purchase much of it on my own. It has been my plant-based protein of choice since before I started blogging. I do not make any money off any Vega sales or posts. I only write about foods I love, my blog is an extension of my hobby to make fun healthy food creations for me and my family. ooh I’ve never tried these but this looks like the perfect fall comfort drink. Thank you! They are so good Deborah, you will love them! I’ve never heard of this brand, but I’m loving the ingredients. Maca is amazing, I choose maca squares over dark chocolate when I’m craving something sweet. And paired with pumpkin?! Yes please!!! Heather they are so good, and good for you! I love the Maca Mocha, Reishi Chocolate, Maca Cold Brew, and The Turmeric Golden Milk! I’m actually going away for a girls weekend and we will be walking some serious miles and on our feet all day so I’m bringing bottles of the Turmeric Golden Milk! Maca is another fav, right there with you I have a stash of Vega Maca Chocolate Bars always on hand. If you try one of the drinks I would love to hear what you think! I just want to say your mug is so cool! I’ve never heard of the brand before, nor have I tried maca yet, but I do love mochas! Thank you! You can also use the Reishi Chocolate. Neither of them have coffee in them, but if you want coffee the Maca Cold Brew is amazing! I’ll have to give it a try with that sometime. I like mochas but most are too sweet and sugary. Thank you! Haha! It depends, usually they are. I make these for myself! The superfood soup I posted last night on IG was a surprise, they LOVED it and it had kombu (kelp), lots of chard, cauliflower, fennel seeds, cumin seeds, black mustard, turmeric… and they already want it again. Of course there is accorn squash which I could bake with sugar like my mom use to and they still don’t want to eat it. Overall they are healthy eaters and they rarely get sick so their eating something right, everyone around them is sick. I need to find that brand, it looks like such an amazing option for coffee fans, like my husband! Yes Alisa, it’s so good and good for you! These two actually don’t have coffee! They are dairy free super herb/superfood drinks! They do make a great maca cold brew though that has coffee! 3 ingredients?!?! Count me in. This looks too easy not to try. Plus I LOVE pumpkin-flavored everything!! YES! Well unless you could the whipped cream. Chocolate, pumpkin and healthy superfoods… on repeat every day! I love pumpkin too! I never thought of combining pumpkin and mocha but now I can’t stop thinking about how delicious this sounds! I can’t wait to try it! Chocolate and pumpkin… delicious! Hope you try it and love it! I have to try this! Sounds delicious! Love this! I never thought to combine the two but it sounds so lovely together! Thank you, it’s so good! I hope you try it and love it! Pumpkin and coffee, yum… but coffee and chocolate even better! Sounds like this would be great for those who like mocha and pumpkins. There is no coffee in it but chocolate and pumpkin and they balance out and are delicious! So easy and looks delicious! Can’t wait to try! YES! Thank you Taylor, hope you love it! A little taste of pumpkin goodness without leaving the house to go to Starbucks. Nice! Yes and it’s healthier and has a superfood boost, and these actually don’t have coffee but you could add it. This looks absolutely amazing and like something I need to have in my life. Can’t wait to give it a try! I hope you love it as much as I do, let me know what you think! I totally just tried this stuff at sprouts yesterday! YUM! This drink is the perfect way to start the day! Isn’t it delicious? Which one did you try? Hi! This looks soooo good! Love the healthy twist on the PSL! Hello Julie! Thank you, yes healthy and with superfoods! There is actually no coffee but you could add it. I haven’t tried Maca yet. I know, I know…I NEED to! I have thyroid issues so I’m sure the added benefit for the adrenal support is needed. I think I’ll give this recipe a shot. It looks amazing! Yes you should look into it, of course I’m not a doctor so do your own research but it’s made a difference for me. Let me know what you think if you try it! I too haven’t tried Maca yet, but this really looks super delicious so I’m sure I’d love it!! There are two versions one with maca and one with reishi, both are great superfoods so there are options. Let me know what you think if you try it! This company and these products sound wonderful! I’ll definitely keep an eye out for them! Since it’s still pushing 90 degrees here, that cold version is totally calling my name! They are so great Sonali, I love them! Let me know if you try them what you think. The cold version is like a delicious rich pumpkin chocolate milkshake, so good! and your mugs are ADORABLE! Where is the white one from? Love it!! Thank you, I just love chocolate and pumpkin together! The white one is from an idea house that they do here twice a year that I got a few years ago. I got 2 and love them but they are odd to drink from. You can’t go wrong with pumpkin and chocolate together!! Thank you for introducing me to REBBL and maca. This sounds amazing and so simple! I can’t wait to try it! It’s delicious, hope you enjoy it! I love all that I can get my superfoods on the go! OMG this looks so good!! i NEED to try this recipe. Thank you! I’d love to hear what you think when you try it! This healthy chocolate looks outrageously good and soo yummy! Thank you! I love it when healthy and delicious come together like this! Wow, this looks great! I’ve never heard of this brand before but just checkout out their websites and it looks like a health food store near me carries it. Def want to check it out. It’s so good! I hope you can find it where you live! I would definitely make the hot version so I can enjoy it as the weather cools. Love a good chocolate treat! It’s so indulging yet healthy! I’m right there with you as it’s been chilly here. Pumpkin and chocolate are so good together! I am always beyond excited for pumpkin everything! And these drinks look delicious!! Thank you! Right there with you! I’ve found PSL are not for me, but maybe that’s because I haven’t tried it with chocolate! I’ve never thought of freezing pumpkin puree! So genius! YES! I don’t know how many times I go to make something and have that little bit left. Sometimes I put it in my oatmeal or yogurt but than I would freeze it sometimes because it makes the best smoothies. Now every fall I freeze a can into my silicon ice cube tray!